The 10' purple Canare L-4ES- Star Quad XLR Male to XLR Female Cable is a 4-conductor cable that features Neutrik Black & Gold male and female XLR connectors and 21 American Wire Gauge (AWG), 40-strand annealed copper conductors. Its shielding is a copper high-density TAC braid that helps provide flexibility when handling. It can be used for handheld and camera mounted microphones, as well as for studio purposes. 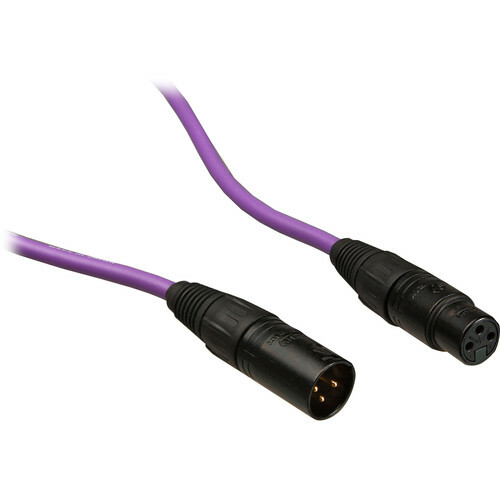 Box Dimensions (LxWxH) 7.0 x 7.0 x 1.0"
L-4ES- Star Quad XLR Male to XLR Female Cable (10', Purple) is rated 4.5 out of 5 by 2. Rated 5 out of 5 by Claude G. from Fantastic VALUE! How can you go wrong? Canare cables at super-discount prices!